Flexilight ignites historical moments. In such an important and symbolic decoration, relability of product and reputation of supplier are crucial for its success. With the outstanding product quality and leading market position, Wide Loyal is the only qualified supplier for the decoration. CLP, incorporated in 1901, has been supplying electricity to 1.8 million business units and households in hong Kong with over 5 millions of prople. 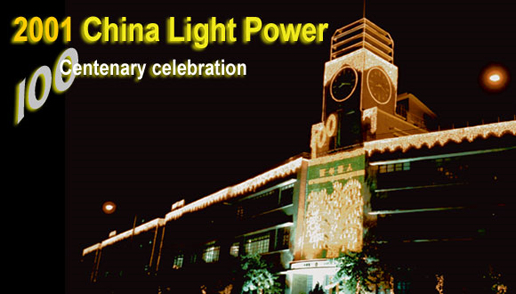 In celebrating the ceremony, CLP strongly emphasized on top quality lighting with high durability and safety standard. Wide Loayl and its Flexilight had gained the trust of the project committee to decorate the head office and highlight its theme. As a company based in Hong kong, it is our honor to be chosen as one of the participants of the CLP Centenary Celebration. Our light marked CLP's centenary with the theme "To reap a return in ten years, plant trees; to reap a return in a hundred years, cultivate people." The construction lasted for a month, consuming about 3,000m of Instant Flexilight and 2,500sets of Flexi-Curtain. The light display, which is based on the Company's Centenary identity, features a robust tree with a hundred lanterns. It symbolized the Company's commitment to people, the environment and its continuous dedication in lighting up every Hong Kong citizen.